For a list of Yugadi publications, please write to yugadipubli @ yahoo.com. …Ferrying Secrets contains everything you’d expect from a multidimensional poet and scholar like Ralph Nazareth, and it provides a trove of unexpected treasures, as well. With the music of many languages in his ear, the poet wrestles with day-to-day life in a shifting context that straddles eras, continents, disciplines and traditions. 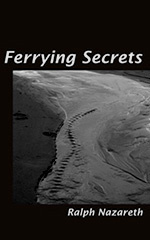 Yugadi Publishers (Hyderabad, India) proudly announce the publication of Ferrying Secrets, a book of poems by Ralph Nazareth. They believe that this book signals the coming of age of Indian-American poetry in a globalized world and moves discussions of bi-cultural experience to a new level. Ralph Nazareth crossed over to the West when young Americans were flying east on their tragic mission in Vietnam. The poems in this book explore his movement between worlds at an apocalyptic time. At once Indian and American, personal and expansive, Nazareth’s work challenges readers to enter the vital mystery of the human, above and beyond national and cultural differences. He does not profess to speak for his compatriots who left India in the mid-60s for the West. But in his imaginative findings and, above all, in his persistent unknowing, they may see something of themselves as they ponder the waste and wonder and, ultimately, the mystery of their departures and arrivals. American readers will hear in the poems of this Indian Catholic their own story re-told in the voice of a “resident alien” mindful of the rich paradoxes bestowed on him by his country of adoption. Born and raised in Mangalore, Nazareth owes much to the great Jesuit educators of Karnataka and Bombay provinces. Since coming to the U.S. in 1968, he has worked in many parts of the country, devoting his time to teaching, raising his children, and the cause of justice and peace. Currently a Professor of English at Nassau Community College on Long Island, he lives with his wife Linda in Stamford, CT.